I used to go to Bulk Barn to load up on different trail mixes. It was nice to have an assortment, but many had lots of added sugar with coated nuts, and it got really pricey too! That’s when I started making this sweet and salty trail mix. It has a bit of salt and a bit of sweet to satisfy cravings and it’s quite affordable to make. When you have a healthy snack like this trail mix on hand it helps prevent you from indulging in less healthy options. If you really want to stay on top of your snacking and portions it also helps to portion some out in a bowl instead of eating straight from the container. I can be so guilty of mindlessly snacking away only to notice I’ve eaten way more than expected. The portion bowl really helps keep me in check and be more conscious of what I’m eating. Sometimes I still go for yet another handful but I feel better being more aware of it and choosing whether or not I want to indulge rather than endlessly snacking away. You can adjust the amount of ingredients to suit your tastes. After mixing some together for the pictures I adjusted the amounts of dried cranberries, pumpkin seeds, and chocolate chips so you get a bit more nuts in every bite. I’m also a huge fan of dried cranberries so I do like to add a little extra of those from time to time. A quick and easy snack to satisfy sweet and salty cravings. 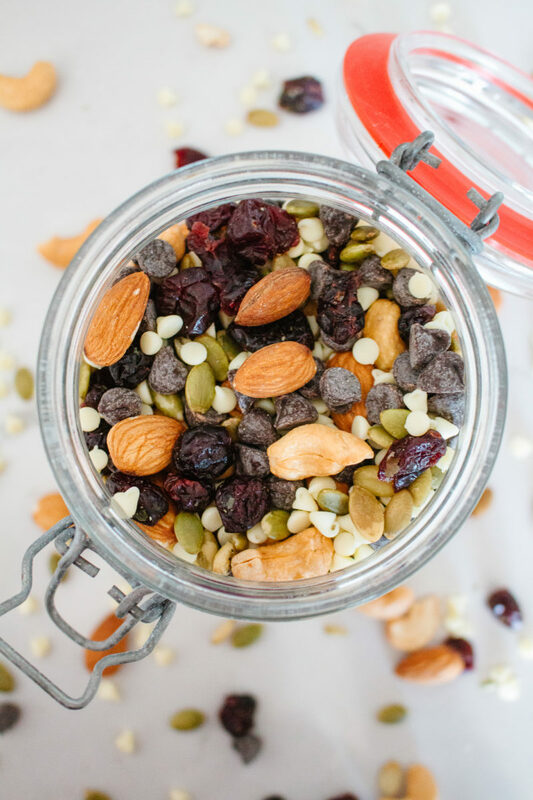 This sweet and salty trail mix is a great healthy snack to take on the go or to eat at your desk. I’d love to hear what you think. If you recreate this recipe please share it with us on social media and make sure to tag @HappyStylishFit and use the hashtag #HSFLife.